In such a competitive industry, it’s always a good feeling when not only your clients have positive feedback, but your very own peers as well. 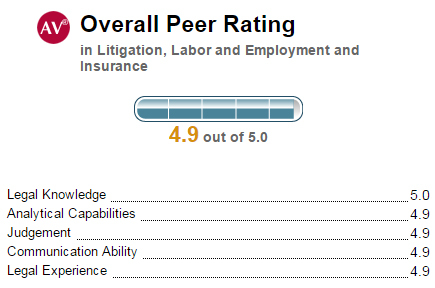 Martindale-Hubbell® periodically and randomly conducts reviews on all lawyers in its directory for the Peer Rating™ Review process. The reviews are organized in two key ways: reviews on randomly selected attorneys/judges and surveying names of legal professionals that lawyers nominated as references. Our latest Associate to be reviewed comes from our Miami office–Sergio Casiano, Jr. Check out his review score above.